(CNN) -- Padraig Harrington's bid to win a third successive British Open title was left in tatters after the Irishman carded a six-over-par 76 in his third round at Turnberry on Saturday. 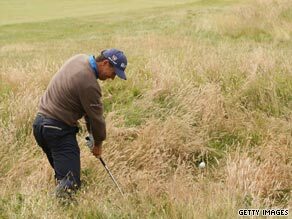 Padraig Harrington hits his second shot out of the rough on the third hole at Turnberry on Saturday. The 37-year-old slumped to nine-over 219, leaving him tied for 64th place and 13 shots behind 54-hole leader Tom Watson. Harrington started brightly with a birdie at his first hole, but then dropped back again with a bogey at the par-four third hole and conceded another stroke at the par-five seventh after hitting the right-hand rough with a 77-yard pitch shot. "It just wasn't my week. I needed things to go for me and there was a little bit of deflation after taking six on a par five," said the Dubliner, who was seeking to emulate Australian Peter Thomson, the last man to win three successive Claret Jugs in 1956. "It was a pretty simple shot and I couldn't convince myself to hit it. I don't know why. It was poor - on another day I'd just see it and hit it. After that it was tough going." Harrington then carded a double-bogey at the par-four eighth hole and dropped further shots on the 12th, 14th and 16th. "It was not a very tidy round at all. I had three three-putts and a few other mental errors," he said. "I started well and faded out rapidly. "I'm certainly happy with my ball-striking, but I'm not so happy with my mental side. But I'm not surprised I wasn't better. I knew that was going to be an issue. I made some wrong decisions and on a windy, tough course you need things to be going for you. "I've always felt a little behind the eight-ball this week - I wasn't quite making it happen." Harrington, who has been experimenting with his swing this year, will now have two weeks off before beginning the buildup to the defense of his U.S. PGA Championship title at Hazeltine in Minnesota on August 13-16. He was joined by some other big names at the tail end of the field, with 1998 champion Mark O'Meara on 11-under after a third-round 77 and Irish Ryder Cup star Darren Clarke one shot better off after a 78. World No. 3 Paul Casey of England was tied for 59th on eight-under after a 74 along with No. 4 Kenny Perry. The 48-year-old American, who lost in a playoff at the Masters in April when seeking to become the oldest winner of a major tournament, shot his worst round of the week, a 75.